Non è necessario mettere la resistenza di pull-up sui pin positivo e uscita del ds18b20 ? Dove si viene definito il pin del micro come ingresso del ds18b20 ? Si, in effetti è meglio farlo, ho fixato il circuito, grazie per la segnalazione. 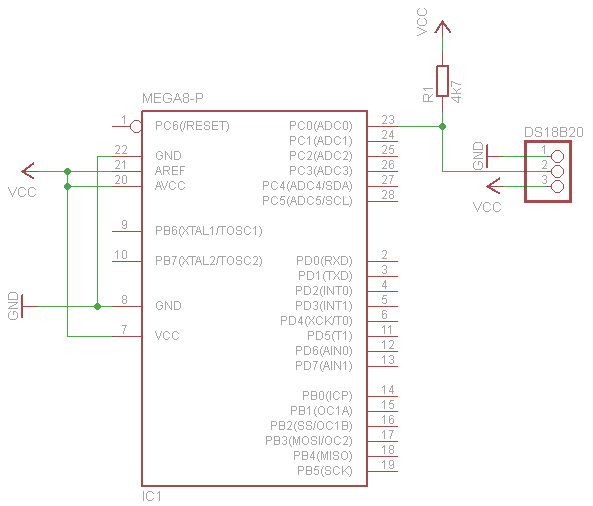 Ho realizzato lo schema indicato sostituendo l'Atmega 8 con Atmega 32, ed utilizzando al posto di un DS18b20 un DS1820. Purtroppo la porta seriale mi indica un valore che varia dai 2.850 e i 3.300 toccando il sensore con un dito. Un indicazione questa molto lontana da quella che dovrebbe essere la temperatura ambiente o quella corporea. Dove potrebbe essere lo sbaglio ? Se hai un analizzatore logico potresti checkare il bus per trovare quello che passa. Debugga i due byte di output raw temperature = ds18b20_readbyte(); temperature = ds18b20_readbyte(); per cercare se la conversione è poi eseguita correttamente. Hi!! my name is Alan, i have a question... this library support negative temperatures? it should, but i've never try it with negative temperatures. Let me know if this works. I want to know, how can i display a float value into LCD, im using a Peter Fleury library, and i use a sprintf function, but when i programming a microcontroller, only i see a question mark (?) into LCD, any idea? I have used your library with an AT90S8515. It showed weird values, like 90C instead of 30. After a short look at the datasheet, I have increased the delays between bytes, from 1us to 2us and everything went fine. Just wanted to let you know about this. Thank you! It may help other people. I have found out the error in my code, it was showed to me by Philipp Klaus while browsing my blog. It is interesting, many people reading weird values, or 85C or 127C might be affected by the same thing. The _delay_us() function is tied to the CPU frequency definition to work properly. I hope it helps some other guys searching for errors everywhere but in the right place. Well done, and thank you for the feedback! I've been having trouble with negative temperatures using this library. I see this is a common issue for the Arduino libs as well. I believe that temperature is overflowing inside the ds18b20_gettemp() code. If you have a freezer or hold a upside down can of compressed air against the probe this is easy to recreate. Hello, thank you for feedback. I've never check this library against negative temperature. I put a not about this. As soon as possible I will check this. If in the meantime you fix this, please let me know. i've fixed the negative temperature reading problem. The version 02 it is not tested against negative temperatures too. Thank you for the fix. I've just integrated the new version into my freezer controller. I have been traveling all summer so I've not tested it with negative temperatures yet. I will know more next week when I have access to a freezer again. The code builds and I see extensive changes have been made to ds18b20_gettemp() so thank you for that. Great. Let me know if it works. Hello. The read and write byte functions of this libarry needs precise timing, Interrupt is disabled to prevent timing errors. It may works even without disabling the interrupt, it depends on the micro resource usage of your firmware. Hope this helps. Hello. Are you using avr-gcc as compiler? Also double check your F_CPU compiler time with your mega1280 fuse CPU settings. If you've got a scope check that the pin output is complaint to the DS18B20 timing, look at the Maxim Integrated datasheet from page 15. Hello. Thanks for your answer. Unfortunately I don't have a scope to check that. Without any scope on output debug get's complicated. Anyway, try at first without any interrupt, try just a simple code. 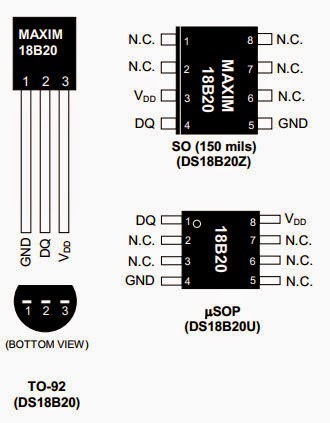 Try the DS18B20 on other platform, like Arduino, just to make shure the sensor is working. Hi again, I tried in Arduino and it works. Back in Atmega1280, when I run ds18b20_gettemp(), from ds18b20_reset() function I get 4. what that means? well, the value 4=0b00000100 means that (DS18B20_PIN & (1<<DS18B20_DQ)) is 1 so I get a error from reset function. But I don´t know how to solve. It could an incorrect timing problem. The _delay_us needs F_CPU directive and micro speed to be consistent. Unluckly, the only way to check it is to scope on that pin. You could also take a look to the Arduino library you are using, and see if there are differences between this and the Arduino code. I will check the arduino code. But I configured the atmega1280 F_CPU 8000000L and the Arduino micro speed is 16Mhz. library doesn't work when using parasite mode. Hi I hope there is still someone monitoring this blog! I am having the same problem as Oscar who posted on August 24th. My mcu is 16Mhz, what do I need to change in delay.c to make this code compatible? I have defined F_CPU as 16Mhz in both my main and the ds18b20.c file. At first, try at 1Mhz, or 8Mhz. Does it works? Have you check the bus with a logical analyzer to see if the signal has the right timing? Hello Davide thank you for the quick response. I tried defining F_CPU as both 8 and 1 Mhz, neither worked. I do not know how to see if the signal has the proper timing on the bus(newbie) and I don't have an oscilloscope available. Previously I did check to ensure that the ext clk was 16mhz. Are there any other possible sources of the error? Hello, the most obvious that comes into my mind it's timing, if you take a look to the ds18b20 datasheet you can read the timing procedures to make this IC works. But there could of course be other causes. Are you using the same power supply of the micro? Can you try this IC with an Arduino, PIC or other hardware and library? Unfortunately I do not have any other hardware to test it on. Are you familiar with atmel studio? Can I define the CPU speed in the compiler without having to use define statements in each source file? I'm sorry but my reference avr toolchain it's Eclipse IDE + the AVR plugin, compiled with avrgcc. Hello, I'm happy to hear that! And thank you for sharing your feedback and your solution. I hope it can help someone else. The degrees C returned from the ds18b20.c are in increments of 0.5 degrees how can I make it more accurate? Well done! And thank you for sharing your answer! so can anyone help me please. I appreciate your job sir. just to comment something here. the manufature provides a unique address code for each sensor and its possible to connect multiple sensors on the same pin and access each sensor by its address.can this be fixed in the library,it could save pins for othe purpose. Now i can not try this code, you have to make some tests. But how to read address from sensors? Hello, this library implements the temperature reading, the OneWire library from the Arduino framework contains a search implementation if you need that. Hope this helps. Yes, it will work at 8Mhz too using both internal or external clock. Just keep in mind that changing fuse settings may block your micro. So apply fusy settings carefully. It sounds like your version of the dallas library can be configured to work with 1Mhz cpu? i have an attiny85 using the Miles Burton library at 8Mhz where it works just fine, but if i drop to 1Mhz it stops working. i'd prefer the lower cpu to save on battery. thanks for any help. Ric G.
Hello, this library should work at 1Mhz. Have you try to compile it with avrgcc? Hi Davide, I've used an external crystal 7.3728Mhz with F_CPU = 7372800UL on the Atmega644pa chip. The readings works initially and after say after 20-30 readings, (temperature range average ~-20oC)the reading stops responding. Where could it be wrong? Is the setting correct?? Thanks. Hello, have you check with a logic analyzer the bus? Check it something going wrong with a uart debugger or use a watchdog. I've never test it with you crystal freq I'm sorry. Hello, it's due to the float representation on avrgcc. Hello, have you check that your micro frequency meets the frequency you have compiled for? Also you can check the bus of the sensor. Your program works fine on ATmega328p 16M. To Andrew: what are settings of your fuses? My arduino UNO not work. Atmega 328P, 16MHz ext. Hello. Unluckly this library can it is developed for one sensor, but you can edit the code and make it running multiple sensors. To have an idea on how to manage multiple output you can take a look at the code of the dcmotor library 01 you can find here: http://davidegironi.blogspot.it/2013/03/controlling-dc-motor-speed-and_6.html. Hope this helps. Hello, it should compile and work with ATmega168 without any changes. thanks for giving very useful data... i had a problem related to hardware. i am using atmega32 micro controller... code wise it is ok i have tested in proteus simulation software. coming to practical implementation i am getting -0.0630 degree only.i have connected 4.7kohms vcc to DQ of DS18B20.. i didn't find the problem where it is... after some time i placed one more 4.7kohms parallel to VCC and DQ of DS18B20. therefore total resistance between VCC and DQ is 2.35k ohms approx, after done this i am getting data(i.e temp). But as per the data sheet they said 4.7kohms. could you tell me the reason how does it work?? Thank you for the library. It works perfectly for Atmega 8 running @ 16MHz, but when i try with ATmega 32A running @ 8MHz, the library does not work. Can you please help me with a DS18B20 library that works with Atmega 32A running @ 8MHz internal RC oscillator. Please help !